This special Bordeaux was a 2012 Christmas gift, a promising red deluge of grape goodness that lasted unopened until tonight, when we decided to open it in celebration of our new (rental) home. In face of great change, one constant in our lives should be excellent wine and an effort to savor some of the finer things in life–and that’s the Chateau Citran Haut-Medoc Cru Bourgeois 2000, for sure. Chateau Citran Haut-Medoc Cru Bourgeois 2000, Bordeaux, France. This is a wine where I wish my palate was more sophisticated; it would make for a better description here for you. At first pour, I could smell the rich, deep–but not earthy or minerally–cherry scent of this Bordeaux. It poured clean, a treat for the eyes too. Note in the accompanying visual that the Citran is so deep in chroma that you can’t see through the glass to the watermelon (harvested from our new garden…inedible…but still a great visual!) behind it. It’s dark but not peppery or spicy, and has more tannins that I generally think of for a Bordeaux. Part of me wanted to decant to see what impact that would have on the wine, but I skipped that step here. Since we are still unpacking kitchen boxes, the Citran accompanied two simple meals; one a macaroni-beef mashup and one consisting of a perfectly seasoned pork loin, “Golden Jewel” blend, and cooked broccoli. My favorite effect was the combination of the pork’s spices with the Citran–really fun. 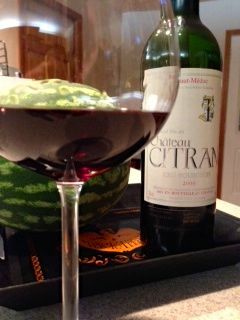 Thanks, Ma, I really enjoyed the Chateau Citran Haut-Medoc Cru Bourgeois 2000 Bordeaux. Great wine; even better celebration.